Asahikawa (旭川市, Asahikawa-shi) is a city in Kamikawa Subprefecture, Hokkaido, Japan. It is the capital of the subprefecture, and the second-largest city in Hokkaido, after Sapporo. It has been a core city since April 1, 2000. The city is currently well known for the Asahiyama Zoo and Asahikawa ramen. On July 31, 2011, the city had an estimated population of 352,105, with 173,961 households, and a population density of 470.96 persons per km² (1,219.8 persons per sq. mi.). The total area is 747.6 km2 (288.6 sq mi). The Ainu called the Asahi River Chiu Pet meaning "River of Waves", but it was misunderstood as Chup Pet, meaning "Sun River", and so it came to be called Asahi River in Japanese (Asahi meaning "morning sun"). On August 1, 1922, Asahikawa was founded as Asahikawa City. As the central city in northern Hokkaido, Asahikawa has been influential in industry and commerce. There are about 130 rivers and streams including the Ishikari River and Chūbetsu River, and over 740 bridges in the city. 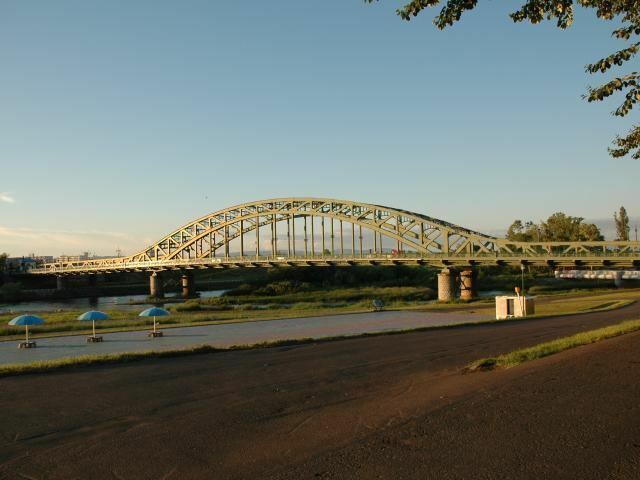 Asahibashi, a bridge over Ishikari River, has been one of the symbols of Asahikawa since its completion in 1932, and it was also registered as one of the Hokkaido Heritage sites on October 22, 2001. Every winter, the Asahikawa Winter Festival is held on the bank of the Ishikari River, making use of Asahikawa's cold climate and snow. On January 25, 1902, a weather station recorded −41 °C (−41.8 °F), the lowest temperature in Japanese history. Due to its climate and location surrounded by mountains, there are some ski resorts in the outskirts of the city. Asahikawa was populated by mainland Japanese in the Meiji period (1868 – July 1912) as a tondenhei, or state-sponsored farmer-militia settlement. Kamikawa District set up under Ishikari Province with the villages of Asahikawa, Nagayama and Kamui in 1890. Asahikawa was elevated to city status in 1922. Asahikawa thrived as a military city before World War II, when the IJA 7th Division was posted there. Today, the 2nd Division of the Northern Army of the Japan Ground Self-Defense Force is headquartered in Asahikawa. According to the Köppen climate classification, Asahikawa features a humid continental climate (Dfb) with warm summers and cold and snowy winters. Asahikawa winters are long and cold, with average monthly temperatures from December through March failing to transcend the freezing point. The city also sees an extraordinary amount of snowfall, averaging just under 7.6 m (25 ft) of snow per year. Summers are generally warm and humid in Asahikawa, with average high temperatures in the warmest months hovering around 26 °C (79 °F). Spring and fall are generally short and transitional in the city. Japan's lowest temperature ever (−41 °C (−42 °F)) was recorded here. Asahikawa developed as an industrial center in Hokkaido after World War II. The city is noted for its lumber and brewing industries, as well as the production of furniture and paper pulp. Asahikawa is served by Asahikawa Airport which stretches over the outskirts of Asahikawa City and Higashikagura, Hokkaido. The airport was first proposed by the Asahikawa City Council in 1955, opened in 1961, and daily flights to Tokyo started in 1970. The present terminal of Asahikawa Airport opened in 2000. It is a second class airport, and also a single-runway regional airport. It serves domestic destinations including Tokyo, but some airlines offer destinations in South Korea. EVA Air added Asahikawa as a destination from Taipei on May 2, 2013. Asahikawa is one of the major rail hubs of Hokkaido. The Hakodate Main Line connects Asahikawa to Hakodate in the south of Hokkaido, and the Sōya Main Line connects Asahikawa with Wakkanai at the north of Hokkaido. The Sekihoku Main Line connects the city with Abashiri on the Sea of Okhotsk. The Furano Line connects Abashiri with nearby Furano. Municipal buses also serve the city. Taisetsu Microbrew Beer "Taisetsu ji-beer"
Asahikawa mutton barbecue "Genghis Khan"
Asahikawa Youth Science Museum "Saiparu"